Specialist recruitment consultancy Outsource UK Ltd has reported a significant growth in turnover, with a year on year increase of 23%. The Wiltshire-headquartered company’s revenues have risen to £46.8m for the year ending 31 May 2015, up from £36m in 2013/14. Material growth has also been seen in the Manchester-based engineering division which now contributes 18% of the company’s revenues, a growth of 6% on the prior year. The engineering division has focused on building its capability within the specialist defence-based engineering markets. The company has been exploiting synergies in compliance and vetting processes that are required for both the financial services and defence sectors. “The ability to provide a high quality service into highly regulated markets is a key Outsource differentiator and a continuing area of investment” added Nick. During the year Outsource launched its Public Sector Division and secured a place on the Government’s Non-Medical, Non-Clinical framework. Commenting on today’s news, Paul Jameson, Outsource’s founder and Chief Executive said: “We have taken steps to strengthen our infrastructure to capitalise on improved trading conditions. This work will continue through 2015 as we look to implement our five year strategic plan. We will build deeper specialist expertise within our chosen market sectors as we expand our service portfolio across the financial services and engineering sectors and look to exploit the growth opportunities that our move into public sector recruitment presents. 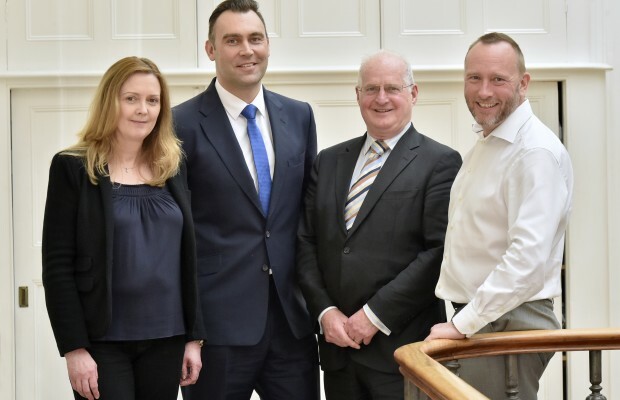 Pictured above the Outsource management team: From left, CFO Sandie Gale, COO Nick Dettmar, non executive chairman Charles Hughes and CEO Paul Jameson.